We are standing in front of a glass liquor dispenser affixed to the wall. There are five bottles of liquor in it, ranging from Nicaragua’s famous Flor de Cana to a variety of rums, vodkas, and whiskeys. Though I am exhausted after the four hour drive from Flamingo Beach, I have just decided that I am going to pour myself a drink if I can figure out to operate this exquisite piece of machinery on our hotel wall above the refrigerator. Since we’re leaving for Nicaragua the day after tomorrow, I figure having the country’s national alcohol is probably a good plan, so I pop open the can of soda, pour it into one of the glasses on the counter, and place the glass underneath the upturned liquor bottles in the glass cabinet. I pull on the handle to try and release the rum, but nothing happens. I pull, push, and twist the plastic handle, and still, nothing happens. A sign that I need to go to bed instead? No—a sign that we need to call our 24-hour room service. After all, it’s all included. A few minutes later, a very nice man named Luis comes upstairs and shows me how to dispense the liquor. Apparently, you need to gently push the rim of the glass up against the handle to get it to work (which, having worked in enough restaurants in my life, should have been pretty obvious…). To make up for my embarrassment, I talk to Luis in Spanish for a few minutes while I fumble through preparing our drinks. It’s a really good drink. Flor de Cana is a smooth, amber-colored rum made in southern Nicaragua near the city of Granada. It’s not bitter or pungent, but instead surprisingly sweet and smooth. For someone like me who doesn’t drink much liquor, I’m surprised how delightful it blends with the soda. We finish our drinks and then decide that since we’re here, we should go to a restaurant. After all, it’s all included. As you might have noticed, I’m a little enthralled with the major selling point of this resort. All and included–these two words are words I’ve never used in the same sentence as “hotel” before, and I’m smitten. Our room, one of the ocean view Junior suites, is a contemporary styled two-room bed and living room suite with balcony. The primary colors are bright white, eggplant, hot pink, and black—colors I’m not exactly used to seeing as bedroom décor but that work exceptionally well for some reason in here. 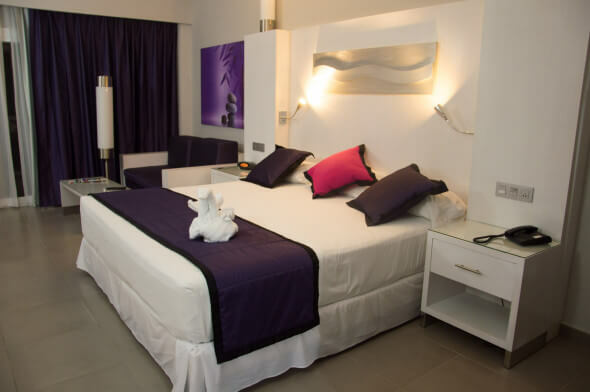 The curtains are purple satin, the sofa bed is a chic, eggplant-colored square beneath a lavender and purple abstract painting, and the king-sized bed is covered in smooth white sheets with a purple and black coverlet and pillows lined in black silk. The room is lit by sleek track lighting. All of the furniture and fixtures are white except for the bathroom, which is made of purple tile and angled mirrors and dressed up in purple accent pieces. While I certainly wouldn’t call it cozy, I’m thinking I’ll call it airy, spacious, chic, urban, classy. It’s all of these words rolled up into one. 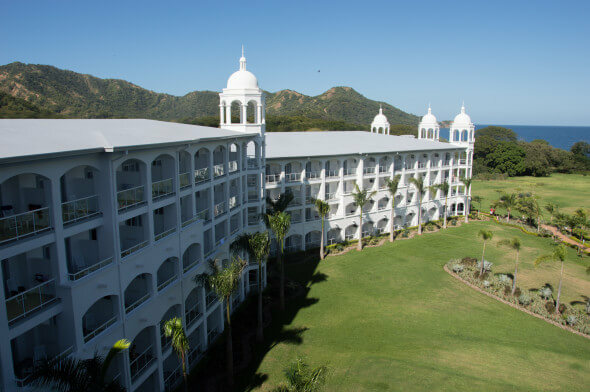 The Riu Palace is a completely all-inclusive 24-hour resort on the Pacific Coast in Guanacaste, Costa Rica. 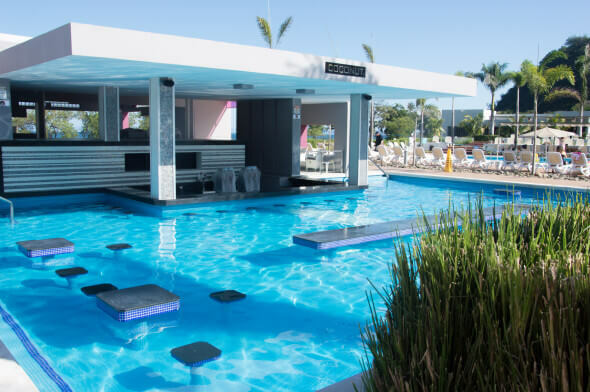 It’s one of several Riu Palaces, all located on some of the world’s gorgeous beaches—in Mexico, Jamaica, the Dominican Republic, Aruba, Spain, Panama…. (all places on my ever-growing bucket list, of course). This is my first Riu experience—and after spending two nights in this Las Vegas-meets-beach resort, I am absolutely sure it is not going to be my last. Though I’ve not exactly ever been the all-inclusive resort kind of girl, with Riu’s spectacular nature setting, reasonable prices, and glamorous white-washed Moorish-style architecture (oh yes, and let’s not forget that personal rum dispenser), I can see myself fitting in here just fine. I put on a cocktail dress for the first time in a week and we head downstairs. The reception is already filled with patrons, ordering drinks from the two bars and pulling purple chairs up to the cocktail tables scattered throughout the lobby. 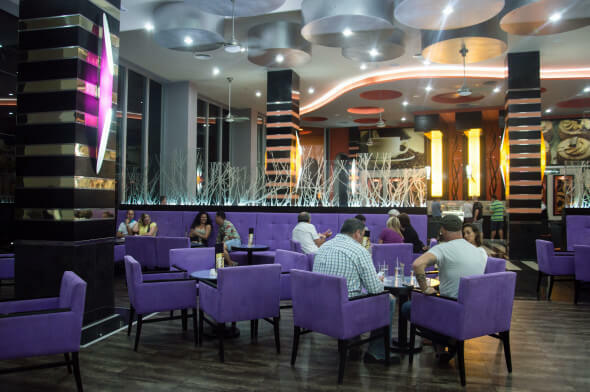 The Riu Palace has four themed restaurants on their property ranging in tastes from Costa Rican to Japanese to Italian to American steakhouse to pure fusion. Twelve. And here’s how it works: you walk in to a restaurant, get a table, order any of the wines, beer, select cocktails, or sodas from their menu from a server, grab a plate and tray, and walk around the gourmet buffet-style menu items around the periphery of the restaurant. If you’re in the Lounge, where you can play games and munch on American-style hot dogs and hamburgers, Capuchino, the ice cream parlor, or Coconut, the main pool’s swim-up bar, the protocol is a little bit different, but at all the other restaurants, that seems to be what the thousands of other diners around us are doing. So we jump right in. The first restaurant we see that’s still taking dinner seatings after 9 p.m. is Arenal, the Costa Rican restaurant serving all of the country’s famous foods—gallo pinto, fried plantains, chicken and rice, fried fish—as well as a number of other foods that accompany these local dishes (a variety of potatoes, freshly-sliced meats, delicate appetizers, cheeses). Though the food is located inside, the seating is on an open-air terrace leading to the four six outdoor pools. We walk inside and fill our plates with everything we’ve come to love during our week in Costa Rica, and we go back to our table, sip our wine, look out on to the beach (did I mention that in addition to a thousand different gourmet food items, Arenal has a 180 degree view of the breezy Matapalo beach?). Next door at the Sports bar (which is fully packed), there’s a band playing on stage and servers are bringing around trays with free drinks to the patrons. By 10 p.m., it’s safe to say that the atmosphere is starting to get a little bit rowdy. I’m imagining that by midnight, the Casino and Pacha, the discotheque, are going to be pretty entertaining. We should go, right? Entrance included? Drinks included? 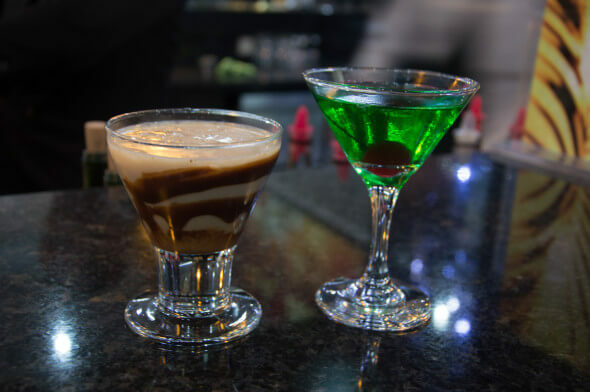 By the time we eat our dessert (which, yes, is also included), we decide there’s absolutely no way we are going to either the Casino or the dance club. For one, I’ve just eaten an obscene amount of food and I’m afraid I’ll barely be able to walk back upstairs to our room. 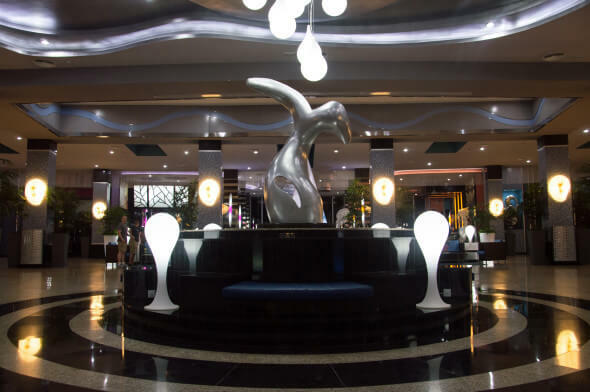 And secondly, we don’t want to use up all of our energy tonight, because we’ve got the spectacular Riu tomorrow all to ourselves tomorrow, too. The next morning, after a luxurious sleep, we wake up early and go for a morning jog on the beach. Though it’s still early, women in bikinis are already laid out on lounge chairs, couples are sitting under parasols, masseuses are giving massages in the shade, and local vendors are selling jewelry, pottery, and other trinkets and souvenirs. There’s an air of calm on the beach—a feeling quite different from the rambunctious, 24-hour party scene inside. We walk up and down the white sand, thinking over how we wanted to spend our morning. We could, after all, do pretty much anything: visit the Renova Spa (though their treatments are not included), spend a few minutes in the steam bath and sauna, go swimming, walk down El Poblado, the main street outside the resort with boutiques, shops, and mini-marts, order room service, visit a restaurant, go see some live entertainment, play a board game in the lounge, sleep in the sun, get a beach massage, order a morning cocktail…. the options really do seem endless here. And in many ways, they are–as endless as you want them to be. After all, that’s what all-inclusive is all about, right? The Riu Palace Guanacaste’s 24-hour all-inclusive rates for the high season (December – April) start at around $140 USD per person/night, depending on the size of the room. To book a trip to the Guanacaste coast in northwest Costa Rica, you can contact the amazing folks at TAM Travel Corporation to arrange everything for you (toll-free number from the U.S. is 1-877-826-8785) or you can book directly from the Riu’s website. You can also book through agoda.com.